Psychic Source has been the most respected psychic service since 1989. The marketing team initially came to us to review the brand message and create a new tagline that best defined their service and mission. The result— “Life’s possibilities. Revealed.” To support this, we developed an integrated campaign called “Revealed.” We designed banner ads and landing pages for various demographics. 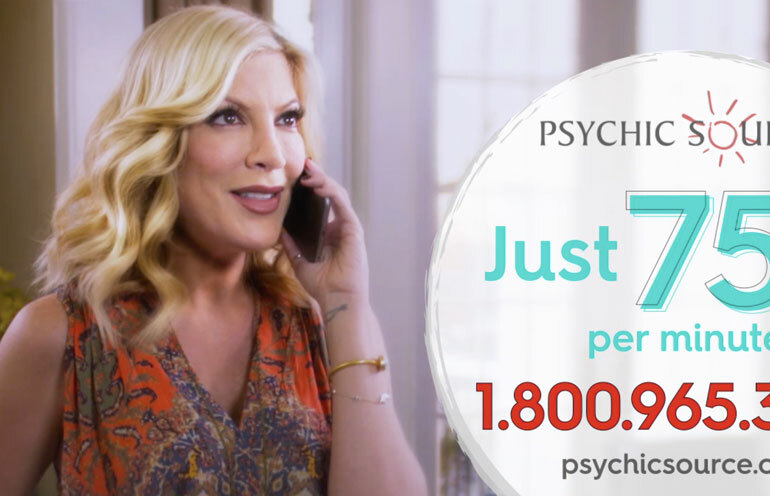 For 2016, they formed a partnership with actress, author, and mompreneur Tori Spelling. Our task was to develop engaging DRTV creative around Tori and her experience with their array of psychic services. By creating a relatable connection to busy lives and the benefits of psychic insights, it would encourage new membership for Psychic Source. Our team delivered a comprehensive media and print campaign that included TV spots in :15, :30, :60, and :120 commercials and radio spots in :30 and :60. On the web, they were supported by landing pages, banner ads, and print. We immersed ourselves in Tori’s brand to create an authentic approach in her passion for psychic guidance and her real life needs as a wife, mother of five, actress and entrepreneur. The creative was relatable and encompassed the many psychic services and solutions that revealed her life’s possibilities. We engaged our production team, produced, scripts and executed the shoot. Tori was flown to Philadelphia where we shot all television spots, captured radio and photography for web and print in one day. Go team. The national commercials launched in February. Overall, new Psychic Source member enrollment for February 2016 was up 13.5% to that same time the previous year. The online initiatives continue to show that the Tori landing pages have an average conversion rate that is 24% better than the average.